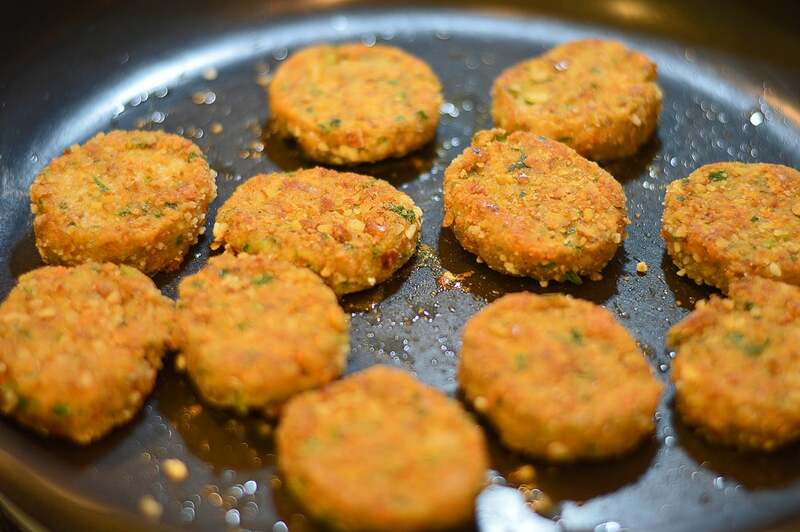 I first created the base of this glorious veggie concoction for a chickpea cutlet that you will see on my soon-to-be-launched vegan site, Living Vegan. It turned out so well, I decided to further develop that base into these little nuggets that both kids and adults will love. I learned a lot from those kitchen failures, so I guess they weren’t really “failures” … more like lessons. The first one was that moisture is the enemy. The carrots, mushrooms and even the chickpeas MUST have any excess moisture removed with paper toweling. This is not optional. 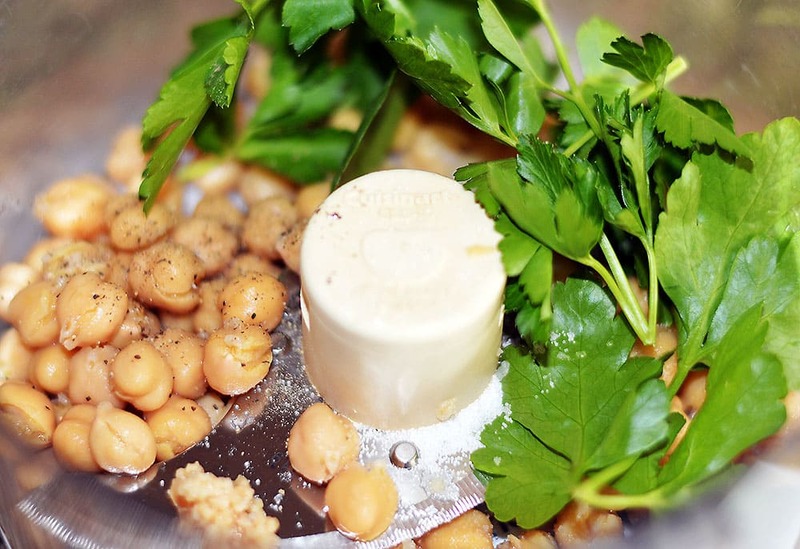 I start with chickpeas, salt, pepper, parsley and garlic in the bowl of a food processor. Pulse until coarsely chopped. Place this mixture into a large bowl. No need to clean the processor for the carrots and mushrooms. 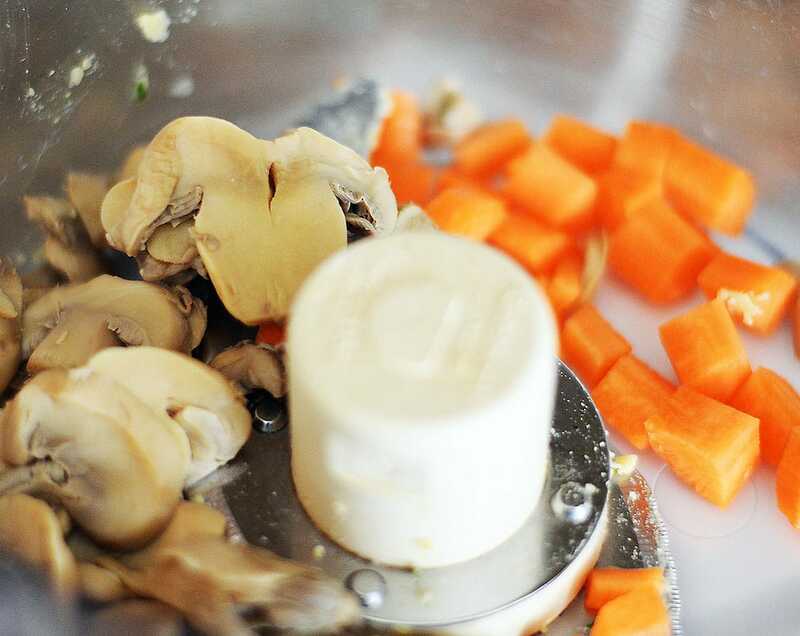 If using canned mushrooms, squeeze them dry and puree to a fine mince. Add to the bowl with the chickpea mixture. So you should have two mixtures that look something like this. 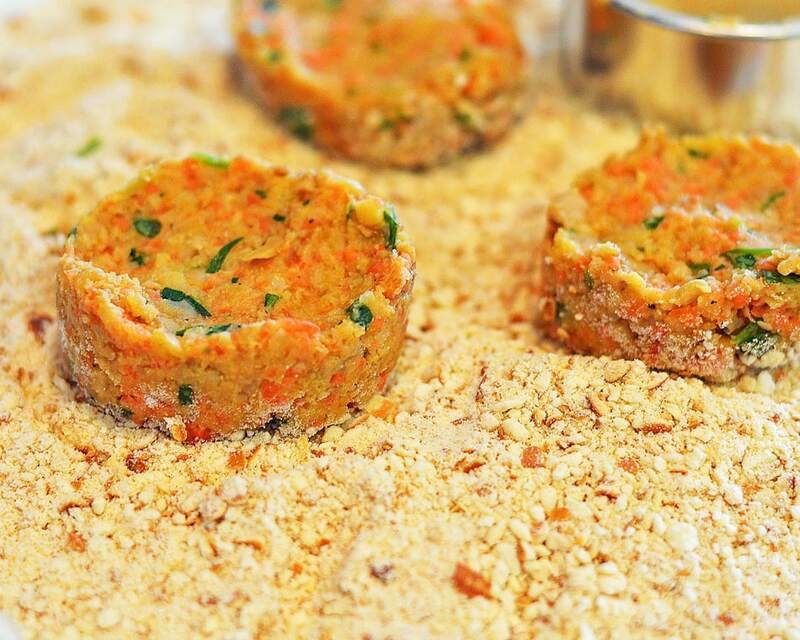 Fold together with the flax “egg”, flour and panko breadcrumbs. Ok, so here’s what we’ve got. If it seems too moist, add just a bit more of either flour or breadcrumbs. It will still be sticky, but should be workable. For this next step, I wanted uniform nuggets so I used an oval cookie cutter. I found that it worked best if I pressed the mixture into the cutter directly on the crumbs. By the way, these are salted pretzels that I ground into breadcrumbs. In a large non-stick skillet (<- this is the set I have & LOVE) over medium high heat, I add about 1 Tbl of oil at a time and this was for half of the mixture. You can drain the excess on paper towels. So here’s an extreme close up and at this point, I am SO glad I chose pretzels. Those little pieces made them crispy and crunchy on the outside and they held together like a dream! 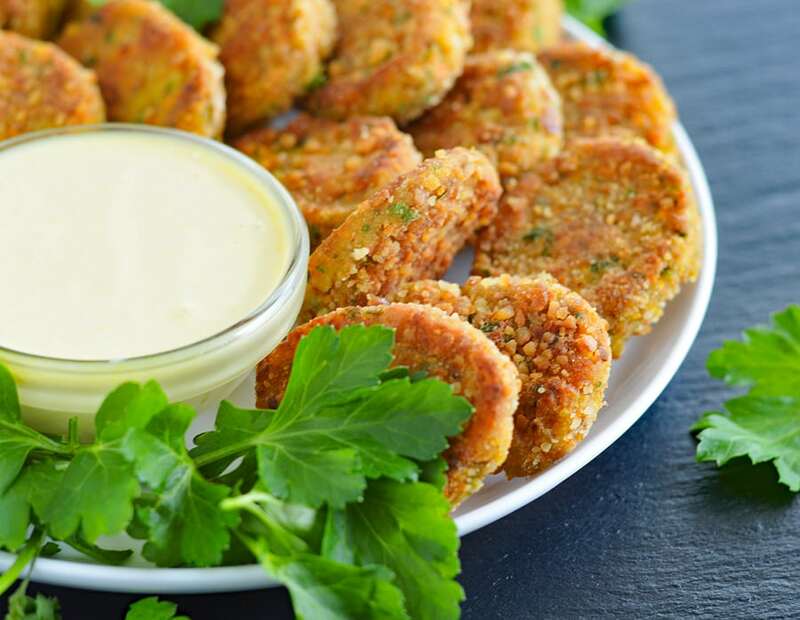 The interior is much like falafel and with the vegan version of “honey” mustard dipping sauce, we literally finished the entire batch! One recipe made 22 nuggets. My oval cutter took about 1 Tbl of the mixture. 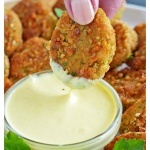 Did you make this recipe for Veggie Nuggets with Vegan Honey Mustard Dipping Sauce? If so, leave me a comment below and let me know what you thought. In the bowl of a processor, crush the pretzels to a fine crumb. Place on a flat plate. Add the flax mixture, flour and panko breadcrumbs. Stir to combine. If it seems to moist, add more flour or panko. It will still be sticky, but should be workable. Damp hands make forming the nuggets easier. 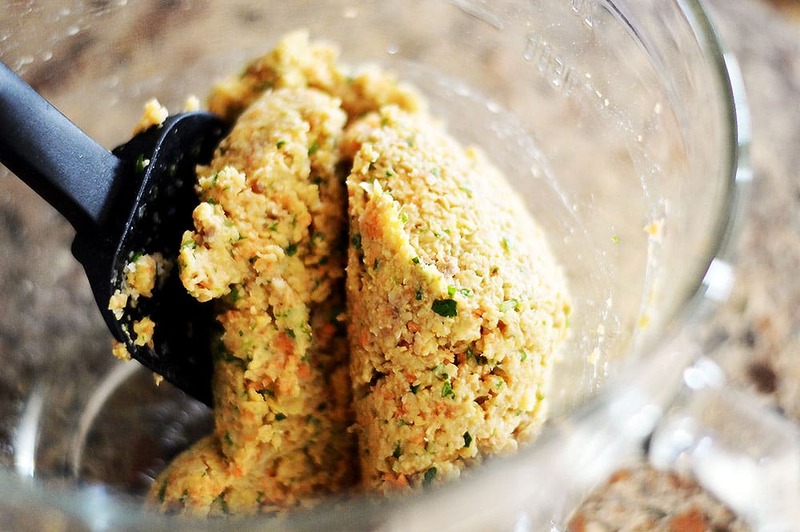 Using a cookie scoop, place 1 Tbl of the mixture directly into the breadcrumbs. You can form by hand OR use the oval cookie cutter as I did. Completely coat the formed nuggets in the pretzel crumbs. Complete all 22 nuggets before proceeding. 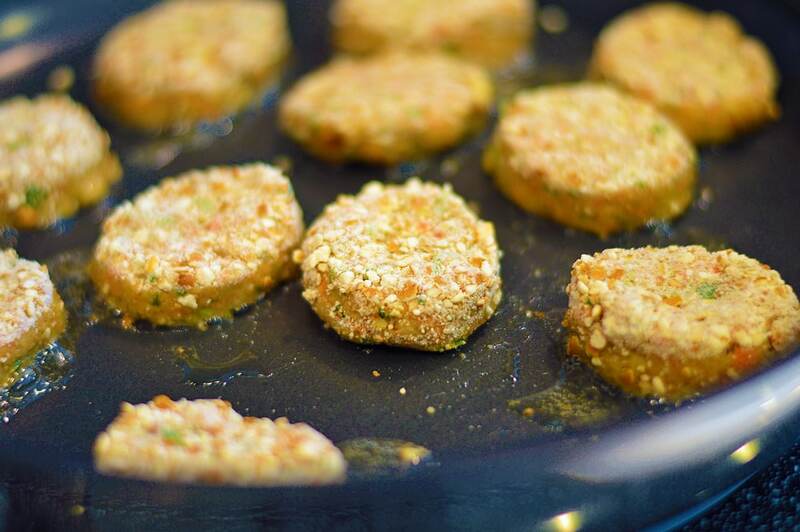 Heat a pan over medium high to high heat and add oil suitable for pan-frying. Add half of the nuggets to the pan at a time and fry until golden on one side. Flip and repeat. Remove to paper toweling to cool. 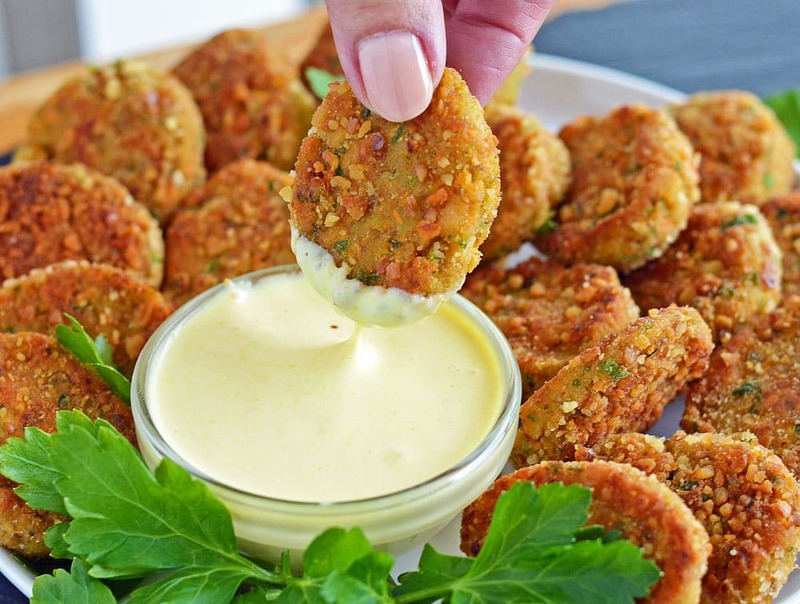 Combine all of the ingredients for the dipping sauce and serve. Can you use fresh mushrooms instead of canned? If so, should they be sautéed first? I really really don’t care for mushrooms. Can I leave them out? Or sub something else for them? Thank you for this wonderful recipe. I used a can of artichokes instead of chickpeas and whole grain spelt flour instead of all-purpose, breaded them in Panko and Vegan Parmesan and served with Cashew Gravy, so delicious! 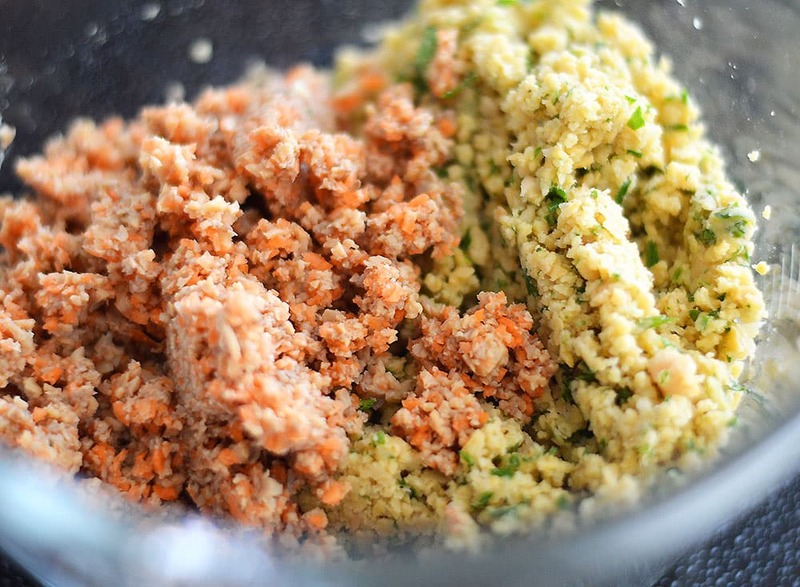 Are the carrots raw going into the food processor? Would they not stay crunchy? Hi Katie, did you ever try freezing these? If so, did they turn out? Quick questions, I have dry chickpeas, would I have to cook them first for the recipe? Hi Linda, yes. Since canned chickpeas are already soaked and cooked, you’ll need to do the same with the dried chickpeas. This is so delicious! I needed to add way more flour to get a less moist mix. And I used fresh mushrooms for the mix and crushed cornflakes to coat the nuggets instead of panko bread. How much pretzels as the recipe doesn’t say.